Happy Friday everyone! Today I have a fun book to share with you! Do you all know Emily Herrick of Crazy Old Ladies? We met briefly at Sewing Summit last October and again this past weekend! Among other things she designs fabrics for Michael Miller and just completed her first book, Geared for Guys! 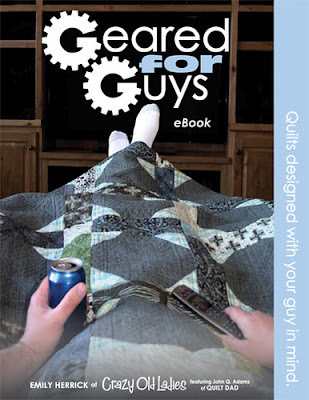 As the title implies, the book focuses on quilting for the guys in your life and includes 8 original quilt designs! 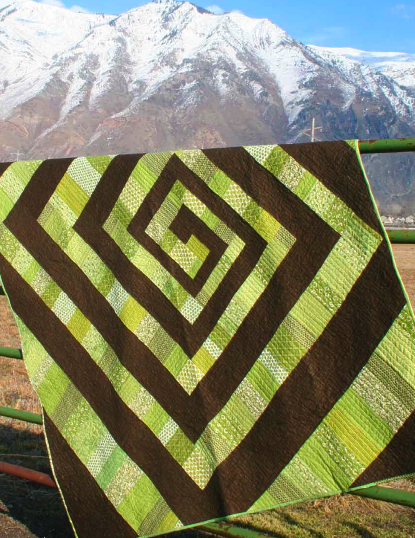 My favorite quilt in the book is called Helix! It looks like it would be a great stash buster, and the construction is really clever! You can find the book in paper and PDF format in Emily's shop here. You might also be interested in Emily's fabric lines for good guy sewing material: Hall of Fame, Going Coastal, and her newest line, Shore Thing! Emily has kindly offered up a copy of the book for one lucky reader! To enter just leave a comment! One entry per person, I'll choose a winner randomly. Giveaway ends Tuesday, May 29th at 5pm CST. Don't forget to stop by and see Shannon of It's Sew Shannon tomorrow for the next stop on the tour! What a great idea to make patterns for guys. I would love to have it to get ideas for sons and nephews. I didn't know sth. like this excited. Great idea for a book. It seems that most patterns are too girly for most guys. I have a lot of guys in my life and would love a copy of this book. Thanks for the giveaway. I love the look of this book. And with heaps of men/boys to make quilts for it would come in very handy. The Helix looks great. Thanks for the chance to win. This guy thinks he would LOVE to have that book, and winning it would be GREAT! What a great idea, a quilt book for guys. I always struggle with finding designs for my husband and sons, and then fabric to suit. Thanks for the chance to win. Thanks for the offer to win this book. I've been drooling over it for awhile! Lovin' Urban Decay. I can think of someone I'd like to make this for! This does look like a fun book, and a neat way to look at color and structure. Thanks for the chance to win. This book looks fantastic. Thanks for the offer, I'm anxious to see one in person. Thanks for the giveaway. This book looks like so much fun! Thanks for the giveaway! I love this book! A book like that is long overdue in the quilting world! We've needed man quilt patterns a long time. This book is on my wish list and would love to win this one. Thanks for the chance! What an awesome book, sewing for guys is sooo hard. OH, yeah, I saw the Helix on another blog and thought--perfect for a son who's going off to college in a year!! This book looks fabulous! Thanks so much! This looks like an awesome book! Thank you for a chance to win one! I would love to win this book - my hubby would finally have a GUY quilt! This is a great book to make a quilt for a son or husband. What a great book. I am glad Emily has discovered this need in the quilting world and decided to address it. Urban Decay - with a name like that it could only be a guy quilt, don't you think? funny, I've just started to think about making a quilt for one of the guys in *my* life... thanks for the offer! The book looks great and I'd love to make the "helix" quilt for my hubby! Thanks for the great giveaway! I love the helix too! I think this book was really needed in the "girly" quilting world! All of us have a man on our to do list that wants a quilt and my husband would be excited if I would get started on his for sure! Thanks for the great giveaway! I love the one I saw from the other pics of her booth that said Gamer. I NEED to make that quilt. I love the idea of "guy" quilts! i am dying for this book!! every quilt i see out of it i absolutely love!! thanks for the chance to win! This would be great inspiration for quilts for my husband and now for my little boy too! Oooh, I like Helix, too! Such a versatile design. Thanks for the giveaway! That helix quilt is amazing! Thanks for the chance to win! Yea! 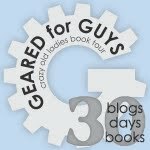 I really love Emily's work and have been following along on this blog tour. Thanks for the chance! how fabulous! thanks for the chance to win! This looks like a great book - it's actually on my Amazon wish list right now, but I'm trying to be good with my quilting book budget, lol! The quilt that Emily design is SO fabulous. I just love it and many others I've seen in the book. Fingers crossed-thanks. Helix is one of my favorites too. The other is Gamer. That's another very cool quilt and perfect for my oldest son. Thank you for the chance to win a copy of her book. I love the fact these are all great guy quilts. Magnificent give away! Would love to win this book. Thanks for the chance! Fantastic! Thanks for the heads up on the book even if I don't win such a great give away my hubs would love for me to make a quilt just for him! What a great book! One of my projects this year is a quilt for my brother - his favorite color is white! Definitely going to be a challenge for me! someday...someway...I am going to sew a quilt for my husband and one for my son. I really must have that book. I've seen several of the quilts from the book and they all look wonderful! I've been eying this book for a bit; I'm crossing my fingers on this one! Seems like I have more guys than girls to make quilts for these days so this would be great! Love the idea of this book. It's time for a new quilt for my son (now 19) and I've seen pictures of the Gamer quilt that I'm interested in. I would love to win a copy of this book! I really want to make Helix! Oh these look like great patterns! I've been puzzling over a pattern to make for my brother who is a single dad... this book looks amazing! If I don't win it, I'm going to have to buy it anyway! I love this book and would love to make something for my dad from it! Thanks for the chance to win! I am surrounded by males, so this is a book(and inspiration) that I need! awesome give away! I would looove this! I really hope I win this book! Thanks for the chance. Awesome book and I'm with you, even though the quilts were made with guys in mind, I love them. I need this book. hehe. Thank you and Emily for a super giveaway and a chance to win a copy. I love that you can get this in the PDF form....makes it eay to download the patterns and print them. Thank you for the giveaway! This book looks so fun! I want that Shore Thing fabric SOOO badly. I can't wait for it to come out. Those blue lobsters - I need them!! Thanks for the opportunity. I want to win this book so bad! Love that Helix quilt. I have some guys who need non-girly quilts. These would be perfect. Since I'm in a house of all guys (Hubby and 2 sons!) this would be a really great book for me! Thanks for the giveaway. A few of these designs are super appealing! I have a few men in my life I'd like to make quilts for! Thanks for the giveaway! Wow, the Helix quilt is awesome. Thanks for the giveaway. WOW! Those quilts look great!!! The first few reviews I read didn't mention helix, but it is definitely my favorite by far. Thanks for showing it off and thanks for the giveaway. Boy that Helix is great! I've been seeing that book around & would love, love, love to win it! Thanks for a chance. BTW, i think your blog is wonderful! Since I am the only girl in the house, including the dog, I would love to win a copy of this book! The book looks fun. It is always harder to design for a guy. Great book! I find it difficult to find quilt patterns that guys would like. Yeah! What fun to have a book with designs for guys..great idea! I'm excited to see this book after reading all about it on your blog. Thanks for the info and giveaway! I love the Helix quilt - I'd love to give it a try! Thanks for a chance to win this book! Count me in! Would love to make that Helix quilt! I also would like Helix for myself! This would be so useful! Thanks for hosting the giveaway. Every time I see another quilt out of this book I want it even more! That helix quilt is awesome! Thanks for the chance. What a great idea! Looks like there are a lot of fun quilts to make. I've been really impressed with everything I've seen about this book - the quilts look gorgeous! John's cover quilt is wonderful as is the helix. Thanks for the chance. I really like the Helix pattern too. I've been wanting to make a quilt for my son's bed, but haven't been able to find anything thats "boy" enough. This would be pretty sweet, I could make my dad a quilt for Christmas! He is elderly and stays cold, so this would be GREAT! I love that Helix pattern too! Thanks for the chance!! My hubby always comments on how "flowery" and "prety" the thing i make are. maybe winning this he might be intrested in a quilt or two. I love the Helix quilt! Oh I so love Helix! Hope I win! This would be an amazing win! My guy has been begging for a quilt. Maybe a couple of these will strike his interest. I am so liking the Helix, the more I see it the more I like it! Can't wait to see this book! To win it would be even better. Thanks for the chance! what a terrific concept for a book! There are several quilts from this book that I'd like to make - can't wait to get started. You have to love a guy quilt book. I love these! Especially the Helix! I've been eyeing this book for several weeks now. I have several men (and boys) in the family that I would love to make a quilt for, and this book would be really helpful. Thanks for the chance to win. It's good to have some ideas for guys! BTW-- great Quilt Market coverage in your last post! This is a must-have book for any quilter's library!! Thanks for the chance! It looks like a great book for the men in my life. OH yes! I need guy stuff! What amazing patterns! Those quilts look really cool. Thanks for the giveaway! I love Helix as well! You could make it in so many colors. I think this book is a real WINNER!! 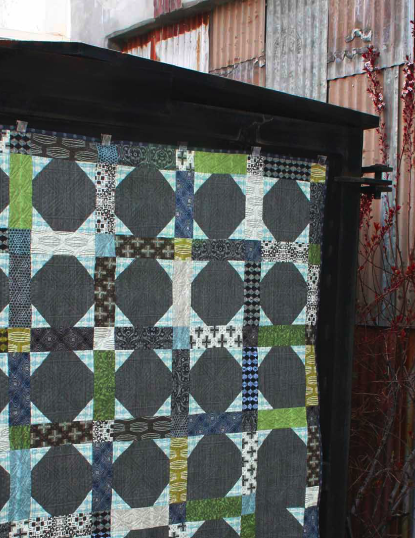 the helix & odd ball quilts in this book look great :) thanks for the giveaway! Thanks for a chance to win. This book is on my must get list! What a great book!! Thank You for the Giveaway!! These quilts look great, with a change of fabrics they could be girly quilts too. That book is so cool. I am married to a farmer and he is really hard to make a quilt for that isn't just tractors so it would be nice to see some other guy quilt ideas. Thank you for the chance to win!! Love the whole idea of this book.. and i love all the quilts in it! I love that Helix quilt too. Nice book. I'm really excited about this book! Thanks for the chance to win! I would LOVE to win this book. I've seen so many wonderful examples from it! I love helix! I may make that one for my Dad! The book looks so cool. Thank you so much for the giveaway, I'm really interested in this book as after I finish up my current projects it's time to dig into a quilt for my husband. Great guy quilts! Thanks for a chance to win the book. I've got lots of guys in my life. I could sure use this book! Oh, this book looks really good! love the patterns I've seen sneak peaks of in this book. I know my husband would love to have some of these to call his own! I know my guy would like it if the pinks and aquas weren't so omnipresent! The helix pattern is so fun! I'd love to make that for my hubby. This is so awesome! I was just looking for a pattern to make a quilt for my hubby. Manly quilts are hard to find. My son loves anything I make - especially souffles. This would be great inspiration for a quilt for my little man! My husband has always wanted a quilt for him. He thinks that all my quilts tend to be too Foo Foo for him. okay, that Helix quilt is AMAZING! imagine it in vintage sheets? i'm determined to finally start USING my ginormous stash, and that quilt would be perfect. thanks so much for the chance to win, the book looks fabulous! The book looks fantastic. In the past I have resorted to denim and football print fabric for guy quilts but these quilts look masculine and sophisticated. Well done. This is super cool. My husband is always super skeptical when I tell him I want to sew him something! :P I too really love that Helix quilt. I love the color combo and the design. This looks like an awesome book! Thanks for a chance at the giveaway! Great ideas; really like Helix! The book looks amazing and with 4 boys to sew for I could sure use it! Thanks for the giveaway. Thanks for the chance to win. There was a need for guy quilts patterns. This may seem odd but I fancy making one of more of these for my soon-to-be-born grandson. His mother is a photographer and a fan of graphic design so these would be perfect. Great blog, by the way. I appreciated your tour of the quilt show since I live too far away to go myself. Love the Helix pattern too. Thanks for the chance to win. i've been eyeing that book! :) looks like so much fun! thanks jeni! What a great giveaway! Would love to make something for my husband. Thanks for the chance to win this great book. A great book for sewing for the men in your life - some of the most difficult quilts to make. The inspiration is fantastic! Great sounding book - would love to win a copy. Looks like a great book I need! I still haven't made my husband a quilt! I have lots of nephews, a brother, a dad, a hubby, and a son. This book would be fabulous! Thanks for the chance to win! I love the concept of this book! I also love that the cover quilt is made from David Butler's line. I am making a quilt for my hubby for Father's Day (his first) from that line because it just says MAN. Actually when I look at it I think of Old Spice, haha. Thanks for sharing, I hope I win! This would be great as I am trying to find a pattern for my nephew who graduates high school next year! Great idea! Guys like quilts too. What an awesome idea! It's definitely on my wish list! Oh my - I know a few guys that would LOOOOVE that Helix!! Thanks for the chance to win such a cool book!! Love the new bright colors! I just love all the oranges and lime greens out now. And would love to make the helix quilt, the design is great! Great designs for guys in the book, I'm sure any guy would love. Thanks for the chance to win. I'v wanted to make a quilt for my son and now I have lots of patterns to chose from thanks. O H MY GOODNESS! This would be awesome! Making camper quilts for our family and the hubby and son could use a geared for guys quilt!